We invite you to explore India - the Land with infinite beauty ! Whether you soar high into Himalayas or peer under the ruins of the Ancient monuments dotting the landscape of India, you will cherish the experience long after your visit ! This India Travel Guide on Nandan Kanan Wildlife Sanctuary is free from any commercial interest! This site is dedicated to promote India - the vast subcontinent, its glorious past, magnificent landscape and its infinite variety. Set amidst Chandaka forests at Khurda, Odisha (Orissa), Nandan Kanan wildlife sanctuary is popularly known as the 'Garden of Pleasure'. About 13 kms from Bhubaneswar, Nandan Kanan was established in 1979. It is a one-stop paradise - a fusion of a botanical garden, zoo with animals, Kanjia Lake and an amusement park. The sanctuary is named after the 'mythical garden' of the gods mentioned in the Hindu Puranic literature. The story goes that in 1967 a beautiful white female tiger was strolling across this area. On seeing an enclosure, she began to stay put there. This was unusual as generally no animal would like to stay in a prison. This was the time when the tiger population in the park was almost on the verge of extinction. The National Geographic Magazine opined that it would be good to convert this zoo into a protected tiger reserve. Today Nandan Kanan is known for its glorious white tiger cubs born from regular colored tiger parents. There are about 67 kinds of mammals, 18 varieties of reptiles and 81 species of birds housed at Nandan Kanan. Some of the animals are endangered species; Asiatic lion, three types of Indian crocodiles, Sangal lion tailed macaque, Nilgiri langur, Indian pangolin and Mouse deer. Tigers and white Gharials are the main inhabitants of Nandan Kanan. There are about 34 white tigers in captivity at present in Nandan Kanan. Nandan Kanan has a special distinction as the first captive breeding center for gharial crocodiles. White tigers are found in many numbers at Nandan Kanan. It was in 1980 that these regal animals came here and in 1980 the first litter of white tigers was born. 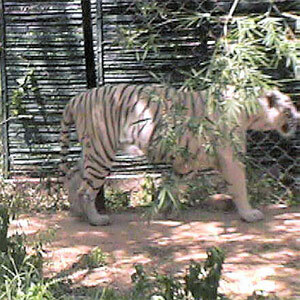 Subsequent litters of white tigers have been distributed to zoos both in India and abroad. The blue and yellow macaw, white peacock, green winged macaw and open billed stork are seen in the park. There are 34 aquariums to study the freshwater fishes here. The Reptile park has a life-sized Tyrannosaurus Rex standing on the gates as a sentinel. The botanical gardens at Nandan Kanan are spread over the Kanjia Lake. Boat rides on the rippling waters of the lake are popular. A thrilling jungle safari takes you within the park. With the ropeway ride and boating facilities across a natural lake, lion safari and nocturnal animal house, toy train for children and nature trails, Nandan Kanan is a favorite with the entire family. The sanctuary is open all through the year. The best time to visit would be from October to March. The nearest railway station is Bhubaneswar, which is also the nearest airport.